Wednesday January 16th 1884 I was busy about the work all the forenoon Hatt was over in the afternoon. 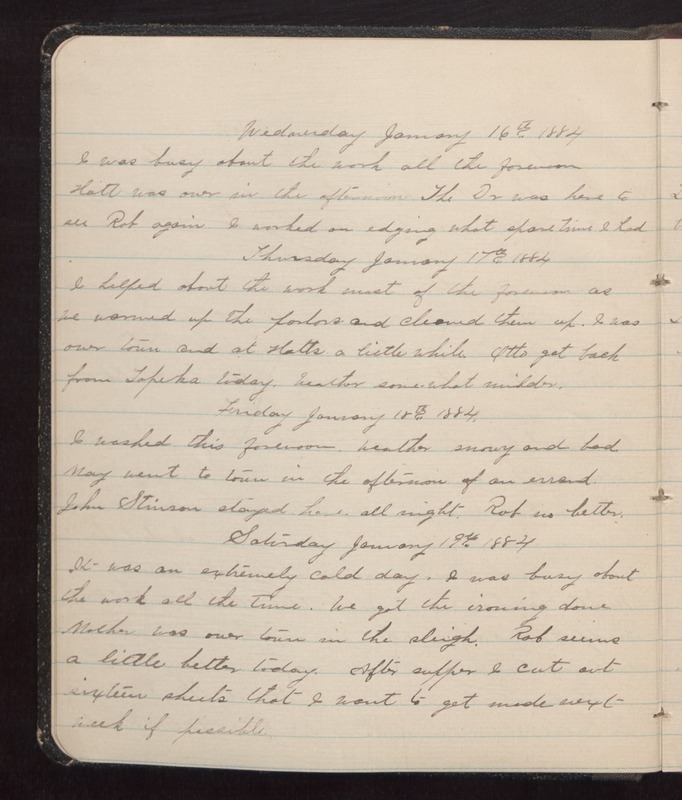 The Dr was here to see Rob again I worked on edging what spare time I had Thursday January 17th 1884 I helped about the work most of the forenoon as we warmed up the parlors and cleaned them up. I was over town and at Hatts a little while. Otto got back from Topeka today. Weather some-what milder. Friday January 18th 1884. I washed this forenoon. Weather snowy and bad May went to town in the afternoon of an errand. John Stinson stayed here all night. Rob no better. Saturday January 19th 1884 It was an extremely cold day. I was busy about the work all the time. We got the ironing done Mother was over town in the sleigh. Rob seems a little better today. After supper I cut out sixteen sheets that I want to get made next week if possible.